Beer. Done right it's considered the nectar of the Gods, done badly it's like dishwater gone bad. You might think that the only way you could guarantee your consumption of the former was to buy it, and buy a decent brand as well. But that's not strictly true, beer brewing is just a matter of following a recipe. And that's not that hard is it? People follow recipes every day. Ok, so starting your own mini-brewery is slightly more difficult than making salad. And it did get a bad reputation for itself in the 80s when a whole lotta people made a whole lotta awful home brew – but most of those lotta people made mistakes in the cleaning process. Their first batch might have been OK, but if you don't sterilise every single thing you're planning to use in the beer making process then you can easily get into trouble and grow things in your beer that don't taste great. So if you can remain committed to the first step: the cleaning – which seems a long, long way from enjoying a pint of the amber stuff – then you're well on your, very easy, way to a good beer. 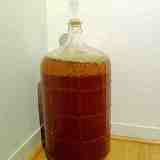 You'll also need a quality Home Brew Starter Kit. These come in all different varieties from pilsners through bitters to stouts, and include the yeast, grains and or malt and or hops – sometimes along with the barrel you'll need to ferment your beer in and the syphons, air locks, grommets and 'o' rings etc. you'll need in order to get it in and out of the barrel. Some kits contain a second barrel for serving, and/ or bottles and caps, which really helps. In case it's not clear you need two barrels or a barrel and a set of bottles. Check your brew kit when you buy it, not all of them come with a plastic spoon long enough to reach the bottom of the barrel, and you'll need one of those as well. And you'll also need 1kg of sugar. Different sugars will give the beer a slightly different flavour, but if your starter kit comes with sugar you might not need to make the choice. You can buy specialist brewing sugar, but it's not strictly necessary. What it is worth investing in is brewers yeast. Your kit will come with it, but the second time round you'll need to buy the ingredients only, and some recipes just say yeast – but getting the specialist stuff in this case will make a flavourful difference. Most kits turn out 30L of beer, which equals about 40 pints, so if your kit doesn't include a set of bottles you might want to procure some – unless you're planning to drink your whole brew in one go. In which case make sure you've got some form of tap. Step 1: Follow the instructions on your sanitiser, and despite want some websites say, don't be tempted to use bleach – if there's any trace of it left behind it gives an air of Domestos to your brew. If you have a dishwasher you might want to run everything though on high as well, just to finish things off. Step 2: Once you're sure everything is spotless, heat up 2L of water to between 70°C-80°C, then remove it from the heat and add the malt if your brew contains any. Give it a good stirring, then add the sugar and hops or grains etc. - in fact add everything your kit tells you to, except the yeast. Then give everything a good stirring and pour it all into your barrel/ bucket, which you should then top up with cold water – purified please, or boiled up and left to cool. This is the moment when the long plastic spoon becomes essential, 'cause once the cold water has been added you need to give everything a good stirring again to make sure that you get plenty of air into your brew. Step 3: Once the mix has cooled add the yeast and show it some more stirring action, then cover with the air tight lid with the airlock in place. And, this is the hard bit: leave it in a warm place for seven days. Lots of people opt for the airing cupboard, but you're looking for a temperature of between 21°C-27°C, and many people's airing cupboards don't get this warm. If you can't find anywhere warm enough you're going to need to leave your mix to brew for longer. You should be able to tell when it's ready because the bubbling will stop – or at least slow to a rate of one bubble every two minutes. This marks the end of the primary fermentation process. Don't be tempted to move it on to the secondary fermentation stage early – great beer requires patience al the beer adverts say, and they're right. Step 4: Once you're satisfied that you're ready for secondary fermentation, put a little priming sugar – this will have come with your kit – into your bottles or second barrel and then use your tubing to syphon your beer from the original barrel/ bucket into the new barrel or bottles. Steady does it with this phase, you want to leave the sediment in the original brewing barrel. You might find sediment in the first bit that comes out of the barrel and in the very bottom, try not to let this get into the secondary fermentation. If you're syphoning the beer into bottles leave about an inch of space in the top and then put the caps on right away. You'll need a capping machine to do it, so if you didn't get your bottles with your kit make sure you source one of these as well. 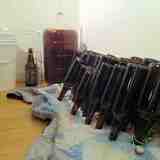 Step 5: After another two or three days move your barrel or bottles into a cold place where they won't be disturbed. This is the third challenging part of the process: you now have to leave it alone for another two or three weeks. Step 6: You've made it this far and the good news is that the final step involves cracking one of the carefully secured caps off one of your bottles, or else pouring yourself a glass from the barrel. Congratulations. You might not be a master brewer yet, but you're on your way. 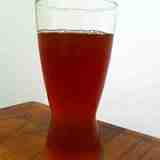 Check out the list of recipes on Brew UK for ideas on how to brew your personal take on the Perfect Beer.